Join members and friends for our joyous winter benefit. Enjoy an evening filled with laughter, camaraderie and awe for this beautiful peninsula. The evening program features inspiring stories about the wild places and wild things you have helped to protect, with a sneak peek at the year ahead. Tickets are $85 per person, with all proceeds benefiting our land protection efforts. Register online by February 14 or call our office at (920) 746-1359 to register by phone. Proceeds from ticket sales help to support the Door County Land Trust’s land protection and restoration work. You will receive a receipt for the tax-deductible portion of your ticket price. Social with wine, hors d’oeuvres, Door County pasture-raised Waseda Farms New York Striploin, vegetarian selections, and delectable home-made desserts. Back by popular demand…Land Trust trivia! Our emcee for the evening, Executive Director Tom Clay, will lead us in a round of questions to highlight the best of 2018 and preview what’s ahead in 2019, including new protected lands, critical restoration of native habitat, and a sneak peek at our outdoor adventures and outings. Play along as we begin a ‘Year of Discovery’! During the evening program, we’ll introduce Mike Carlson, Executive Director for Gathering Waters: Wisconsin’s Alliance for Land Trusts. Mike and the staff at Gathering Waters advocate tirelessly to protect Wisconsin’s conservation heritage and the Knowles-Nelson Stewardship Program—a fund that has helped to protect thousands of acres in Door County. The Stewardship Program is up for renewal and Mike will share the latest on their advocacy efforts. In the event of nasty “midwinter” weather on the night of the event, we will contact you via email with any change in event plans. (Alternate weather date is Sunday, February 24th, 4:30 pm.) For last minute news, you may call our office at (920) 746-1359 to listen to our voicemail message with current information on the status of the Midwinter Gathering. 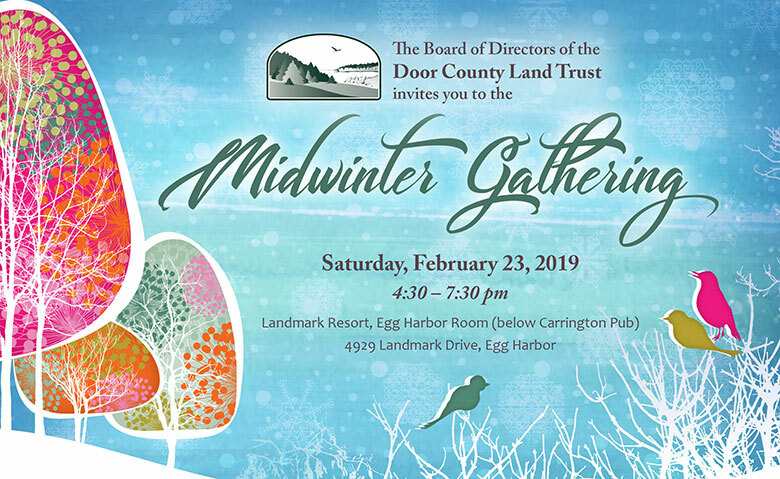 Many, many thanks to the Midwinter Gathering Team…Penny Beerntsen, Kathy Blankenburg, Laura Maloney, Windsor McCutcheon, Gail Mullaney, and Kathy Wolff; the many volunteers, and our generous Midwinter Gathering sponsors for their combined effort in bringing joy to this midwinter event. Thank you all!